If your idea of a vacation is reconnecting with loved ones or special friends, these properties provide just the ticket! Our larger homes sleep 10+ (please note in Talbot County 12 is the absolute maximum occupancy) and have amenities for all ages to enjoy. From refreshing swimming pools to private docks for fishing, kayaks, bikes and much more. 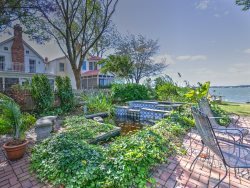 Check out the selection of our multi-family vacation homes in the Chesapeake Bay area and please inquire about a specific homes amenities before booking.